1) Clean the chicken pieces. Pat with dry cloth. 2) Mix the chicken with ingredients from 2 to 14 and marinate for at least 20 to 30 minutes. 3) Soak saffron in 3 tbsp of hot water or milk. 5) Take the ingredients from 17 to 22 in a muslin cloth wrap it and put into the water. 6) Add the black Cumin and salt to the water. 7) When the water boils ,add soaked rice and continue to cook until the rice is half cooked, i.e rice should roll over with boiling water. It takes about 2 – 3 minutes . Drain the rice and keep aside. Dont overcook the rice. 8) Place all the marinated chicken pieces in a large thick bottom pan, one layer of chicken and two layers of rice. 10) Sprinkle ½ the fried onions ,½ the saffron milk , ½ of the chopped mint leaves, ½ of the Chopped cilantros, ½ of the garam masala powder ,½ of the Green cardamom powder . 11) Repeat the above step for the last layer of rice, that is, arrange the last layer of rice and repeat the 10th step. 12) Add 1 tbsp oil or Ghee , also sprinkle little bit of water, 1 or 2 tbsp. It is for keeping the Biryani moist. 13) Now we can seal the container either with flour dough or Muslin Cloth and make it air tight so that steam wont escape when we cook. This will help the biryani to cook fast and will be super moist. 14) Place a heavy object on the top of the container, so that the steam doesn’t escape easily. 15) Cook biryani for 5 minutes on high until stream escapes through the seal. 16) Then reduce the flame to medium low and continue to cook for another 20 minutes. ? Lets sit for 10-15 minutes before opening it. 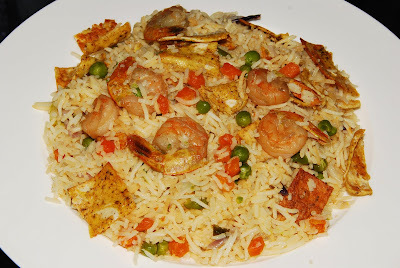 17) Mix the rice and serve it hot with raita. Recipe inspired by Sanjay Thumma and Singh of KhanaKhzana. Thanks and Hats off to them. How to Marinate the chicken Pieces? Mix the Chicken Pieces with all the ingredients well and Keep it in the refrigerator for about 1/2 hr to 1 hr. It will be more tasty if it is kept for more than 1 hr.It depends on your available time. 1. In a mixing bowl, combine the cornstarch, teriyaki sauce, brown sugar and ginger/garlic paste,sugar. Mix thoroughly. 2. Boil the mixture in a saucepan and stir it well till the sauce gets thicken. Add wine and stir it again and add the grated apple pieces and pepper powder.meat. Cook until mixture boils and thickens, stirring frequently. Allow it to cool. 3. In a large skillet or frying pan, over medium/high heat, pour oil and saute the Chicken Pieces until browned and juices evaporate.Fry the Chicken Pieces well until it is soft and tender. 4. Add half of the cooked sauce to fried Chicken Pieces and cook it till the Chicken Pieces gets a nice glazing to it. 5. Pour some more sauce on the cooked pieces and serve it hot. :- Teriyaki – Teri + Yaki means Glazed Beef/Chicken. :- Teri means grilled or fried Chicken or Beef. Note :- U can add Sugar or Brown Sugar to increase the sweetness.Keep on tasting the sauce to check the sweetness.You can even add 1/4 tsp of chilly powder to get ur dish a little hot. :- Better to fry the Chicken pieces with out oil, by turning it to both sides and fry it equally. 1) Wash broccoli and cut off broccoli flowerets. 2) Slice stems 1/4 inch thick lengthy pieces. 3) Heat oil in a pan ,stir-fry broccoli 5 minutes until crisp-tender. 4) In small bowl, mix soy sauce and cornflour and 4 tbsp water. 5) Add honey, ginger paste and pepper powder or hot pepper sauce. 6) Pour the above prepared mixture over fried broccoli and add salt. 7) Cook until sauce thickens slightly. :- Dont add too much salt because its a sweet dish. You can add more Sugar or Honey if u need ur dish to be more sweet. :- This dish will go fine with Chinese White Rice. 1) Boil the Spaghetti pieces in 3 cups of water.When it is cooked ,drain the cooked spaghetti. 2) Fry the cooked prawns in 1 tsp of oil, add a pinch of salt,1/2 tsp of pepper powder and tomato sauce for about 10 minutes. 3) Add the sliced vegetable to it and fry it for about 5 minutes,dont let the vegetables get over cooked. 4) Add 1 egg, pepper powder and salt and mix well to get scrambled egg ,at the same time the egg should mix well with the vegetables. 5) Add Garam Masala and add the cooked spaghetti to it. 6) Add the other Egg and scramble it,at the same time add the soup cube and the soy sauce, saute it properly. Blend all three ingredients and pour it on a heated and greasy pan when one side is cooked properly then turn it to the other side. Slice the Omelet into lengthy pieces and keep it aside. 3) Take another pan ,pour some Oil when it is Hot,add some sliced Onion and fry till golden brown. 4) Then add the Ginger/Garlic paste,sliced green chillies and fry till raw smell goes and oil seprates. 5) Now add the vegetables and fry till smooth. Add washed Prawns,Salt,Red chilly and mix well. 6) Add Coconut Milk,stir it well till the coconut milk sticks on the prawns and other pieces. 7) When the mixture become partially dry, add the cooked rice ,Ghee and mix it well. 8) Add the soy sauce and Sliced Omelet pieces to the rice and sute it well without damaging the rice texture.Close the lid and keep in the low flame. :- You can add Ajinomoto for improving the taste. :- Serve it after garnishing with finely chopped coriander .